Geeta Nadkarni, President and creator of Baby Got Booked! joins the Business of Story Podcast to reveal how you can win media coverage and develop unstoppable PR without ever hiring an agency again. Not only is Geeta Nadkarni a fantastically disruptive force in the PR market, she is the creator and President of Baby Got Booked! and Baby Got Booked Labs, part of her suite of businesses at Geeta Nadkarni Media Inc. Through her coaching and online classes, Geeta helps businesses and individuals identify and achieve their media and PR goals, all through good ol’ DIY mechanisms. Why pay a company to create a rolodex for you when you can do it yourself more easily, more quickly, and at a less expensive price point? 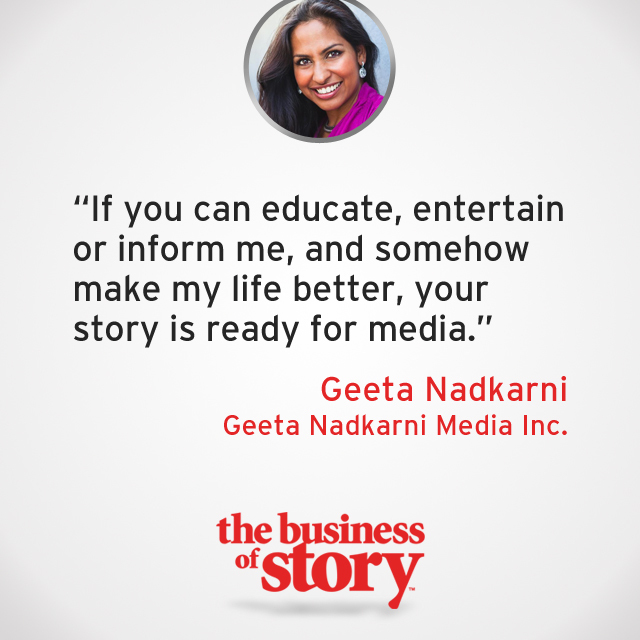 If getting booked by big media or connecting with an already existing consumer base is on your to-do list, Geeta is the one to call. She joins the Business of Story Podcast to put her twenty-two years of experience to the test and to share the best ways to take control of your own story and make journalists, clients, partners, and mentors want more of you. Welcome to the Business of Story podcast, where the world’s best storytellers from business, Hollywood, and beyond teach you how to use stories to communicate and connect with your customers. While technology has given us all global reach with our messages, it’s still the ancient bewitchery of storytelling that connects us with one another. You will learn from some of the brightest content creators, advertising creatives, authors, professors, makers, marketers, and brand raconteurs in the business. Within every show you will learn at least one actionable tip that will make your stories more engaging, and help you advance your personal or professional quest further, faster. A lot of great information about story telling. It is hard to pick one episode, they are all good! I recently came across Park Howell's excellent podcast. I love how he weaves in his personal stories with the interviews of his guests. If you are involved with sales or marketing for your business definitely check out this show.